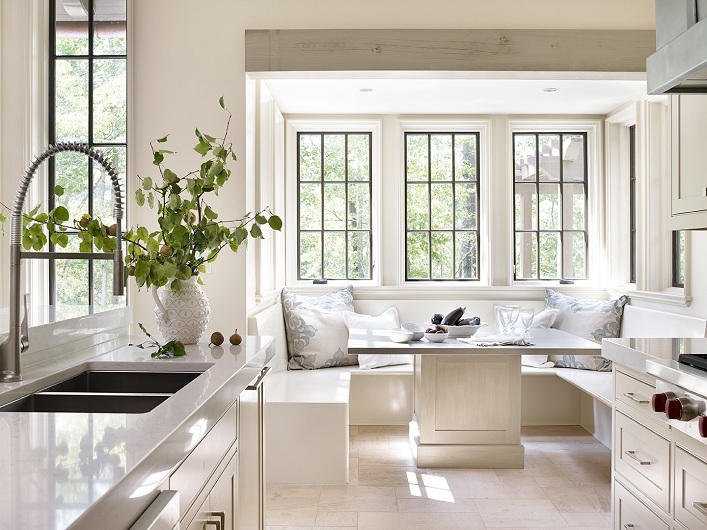 This gorgeous kitchen and breakfast area is designed by architect Jeffrey Dungan. Cozy and practical, this beautiful custom built breakfast banquette is definitely the highlight in this eating area. The high ceiling, the abundance of windows and natural light pouring in from all sides elevate the beauty of this space even further, don't you think? The soft, neutral palette of whites and creams exude a sense of calm and airiness which I love! Such an inviting and thoughtfully designed space, what's not to love? Your thoughts?